This past Friday, I took a trip down to see the Lehigh Valley Phantoms and check in on the Philadelphia Flyers prospects while the team is wrapping up a five game road trip. Let’s start with the AHL experience and the brand new PPL Center. The building costs $191.4 million in raw materials alone, and the entire project cost $282 million to fully construct. This facility it the most expensive minor league complex in the entire country. To give this figure some context, the Hershey Bears Giant Center cost $75 million in 2002, the Mohegan Sun Arena for the Wilkes-Barre/Scranton Penguins cost $55 million in 1999 and recently the Texas Stars built Cedar Park Center for only $55 million in 2009. The PPL Center lives up to expectations and it has become the crown jewel of AHL arenas. The standard has been set for other clubs, but only time will tell if the trend continues. The Lehigh Valley Phantoms won their game against the Springfield Falcons 2-1 and did so by playing sound defensive hockey. Heading into the AHL All-Star break, the Phantoms won five straight games and looked to be climbing into the playoff race. However, with the recent departure of Andrew MacDonald and absence of star Nick Cousins, the Phantoms lost some steam. He’s a great leader, and it doesn’t surprise me what he has done. He’s been a huge part of our team this year. He’s a leader on this team. It was tough losing him right before the game like that, but that’s the nature of this league. It happens all the time. You have to be ready for it and guys have to fill in. The departure of MacDonald to rejoin the Philadelphia Flyers has opened the door for others to take a larger role. While the Flyers lack high-end offensive prospects, they’re stacked with defensemen. Look at what Shayne Gostisbehere has done in the NHL, setting a record of 15 games with a point, the longest by a rookie defender and Paul Stastny’s 20 game point streak remains in reach. The Flyers also have standout defenders Ivan Provorov, Travis Sanheim and Philippe Myers, and are all thriving with their junior league teams. The duo of Samuel Morin and Robert Hagg have been solid down in the AHL level. If you look at Hagg (43 GP, 2 goals, 3 assists, minus-10 skater, 26 PIM) or Morin (54 GP, 3 goals, 12 assists, minus-4 skater, 84 PIM) statistically, nothing jumps off of the page, but at the end of the day these two aren’t going to be huge point producers at the AHL, or NHL level. They’re solid and responsible defenders, but they’re not going to create highlights like Gostisbehere will. And there’s still room in the NHL for defensively focused defenders despite the trend towards puck-moving defenders. A knock on both Hagg and Morin is their plus/minus numbers, but I’ll give that some context: Of the 17 players who have skated in over 30 contests with the Phantoms this year (and are still with the team), only four of them have a plus/minus greater than two. Generally speaking, the Phantoms have been outscored this season and the primary reason they’re still at .500 has been the strong play of goaltender Anthony Stolarz, who was named an AHL All-Star. In the beginning, of course it was frustrating. I thought about it a lot. You can’t do anything about it the only thing you could do is go in and do the best you can every shift you get and hope the ice time will go up after that. 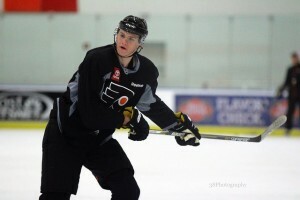 It’s been a learning experience for the Philadelphia Flyers 41st overall pick in the 2013 NHL draft, but he’s growing from it. He’s starting to develop consistency and his vision and defensive senses are phenomenal when he’s hitting his stride. Then there’s Samuel Morin, the hard hitting 6’7″, 225 lb defender. NHL scouts view this young player as a top prospect, and that’s why he was drafted 11th overall in the 2013 NHL entry draft. The knock on Morin has been his sub-par puck skills and low offensive IQ, but with his physical attributes and defensive smarts, it’s hard not to see potential here. One of the areas that Morin really, really, impressed me on Friday night was his vision and decision making in his own end. He rarely turned over the puck or made a bad pass, sure he might not be a huge point producer, but not every defender needs to be a point producer. Often times in the modern NHL, analytics love to discount what solid defensive defensemen bring to the table. But let’s not confuse a bad defensive defensemen with a good one. Someone like Rob Scuderi, Dan Girardi or Justin Schultz are not valuable defensive defenders. Players like Niklas Hjalmarsson, Niklas Kronwall and Jay Bouwmeester are effective defensive defenders. The latter group is the type of player that Morin could develop into with more work. I think he could use another year in the AHL logging a ton of minutes, but he’s got potential. Whatever way you look at it, the Philadelphia Flyers have a plethora of promising defenders and taking a closer look a the Phantoms duo gives hope for the future of their blue line.